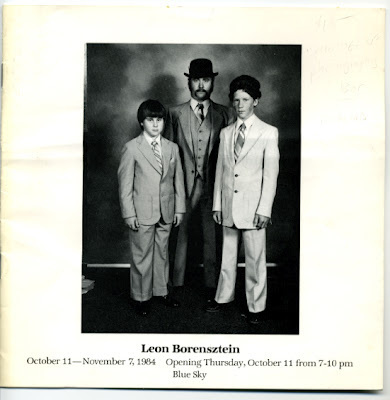 I suppose Leon Borensztein might not technically qualify as Lost and Found since many are already familiar with his work. He's been making photos for over 30 years but it wasn't until last week that he finally appeared on my radar. I was browsing at Ampersand in Portland. 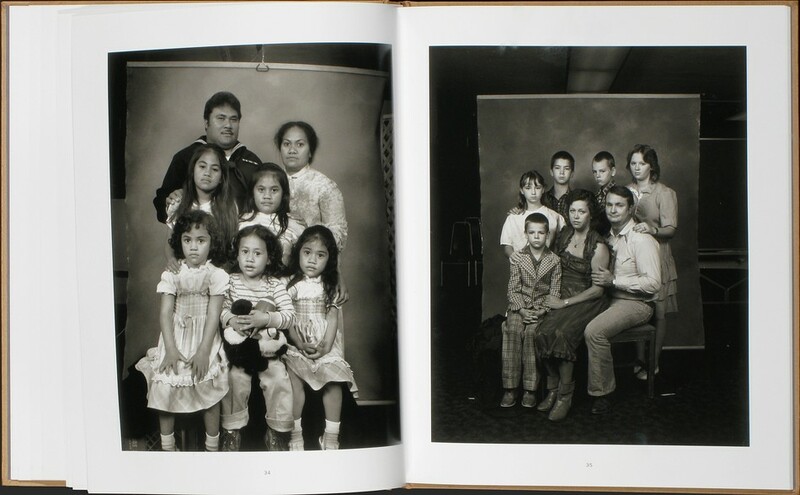 When I stumbled on his new book American Portraits, 1979-1989 I was immediately smitten. I thought many of the portraits were amazing, but what pushed it over the top is that it also seemed to be meta-portrait book, a book about the making of portraits. I hadn't seen anything quite like it before. So once again I found myself unable to leave Ampersand with wallet intact, with Borensztein under my arm. Curse that place! The short backstory is that from the late 70s into the mid 80s —in the era when a good color family portrait was still the realm of the professional— Borensztein worked as a traveling portrait photographer. He brought backdrop, lights, and other props to people's homes, and later to public meeting rooms, where he shot on site. 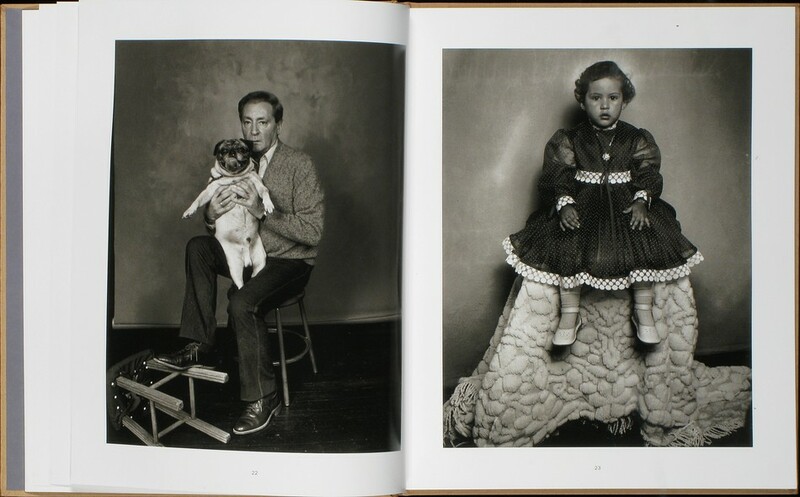 The photos in the book are monochrome outtakes made for his own personal use during the shoots. I knew that the portraits in the book were a few decades old but it wasn't until I got home and started digging online that I realized they'd already made the rounds during their era. 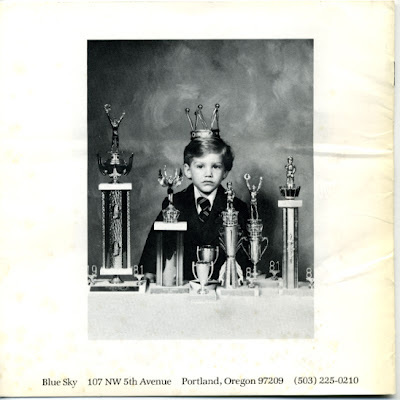 They'd been shown in 1984 at Blue Sky in Portland. Here's the showcard (courtesy of Timothy Archibald). In 1987 Borensztein won a Guggenheim in photography and showed at Fraenkel Gallery in San Francisco. His photos entered the major collections. Career boxes checked. But then as far as I can tell his work did not circulate for a while. In recent years his photos have gradually gained a new head of steam. He showed a few years ago in San Francisco. Then Todd Hido picked up the beat, including Borensztein in Witness Number 7. With the publication of American Portraits (edited by Hido) and a profile on Time's Lightbox Borensztein's star is rising, but I suspect he still remains underrecognized. The Lost to Found ratio is shrinking but uncertain. If the only thing I had to go on were these announcements from the 1980s I think the natural comparison would be to Mike Disfarmer. 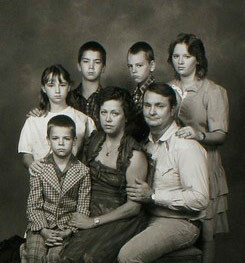 The studio backdrop, the careful staging, and the open vulnerable expressions all seem reminiscent of Disfarmer. Like Disfarmer, Borensztein knew the power of slight eccentricity in the common subject. There's definitely a sense of AFP. 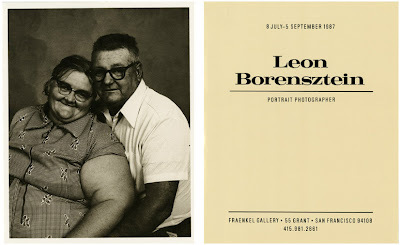 But for me what distinguishes Borensztein's portraits are the non-Disfarmer photos. These are the ones, comprising about half the images in the book, in which Borensztein backs his camera up enough to capture not just the backdrop but also the things surrounding it. Sometimes other family members peek in on the session, or wall decorations can be seen, or props to stand on. By conventional portrait standards the framing is completely wrong. Normally the photographer's job is to hide all that stuff. By including it Borensztein shows not just on the people in the portrait, but lays bare the process of portraiture. They're meta-portraits. If photography has a fourth wall, Borensztein has broken it. This style is not without precedent. Gavin Maitland compares Borensztein's unconventional framing to Wisconsin Death Trip. 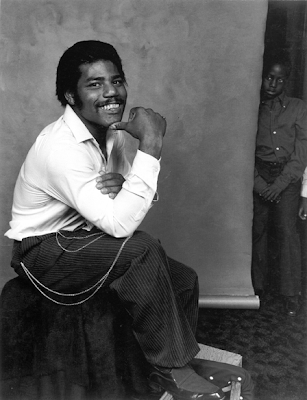 And Disfarmer himself often drew more attention to his backdrops than the picture required. The mysterious dark line behind many of his subjects could easily have been hidden. So perhaps by including it Disfarmer meant to comment on portraiture? Only he knew for sure. 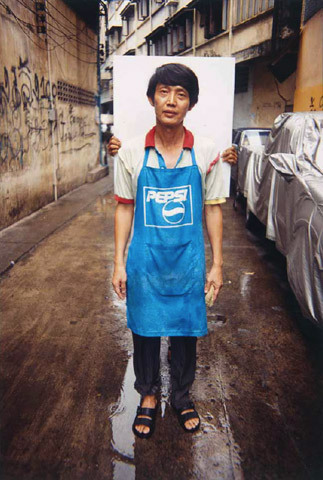 More recently, Michael Itkoff's Street Portrait series played with the artifice of backdrop. 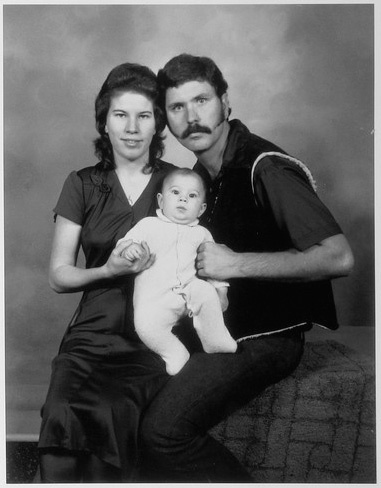 So instead of Archibald's description of Borensztein, Bill Owens meets Sears Portrait Studio meets Richard Avedon, a more accurate melding might be Diane Arbus meets Michael Itkoff meets Chauncey Hare. 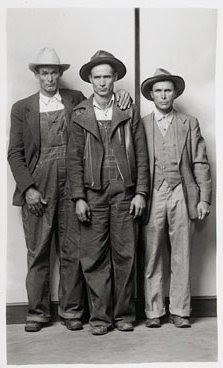 Or perhaps Mike Disfarmer meets Awkward Family Photos meets Bill Burke. Great photographers all but I don't think any of them twist composition to the extreme of Borensztein. In photos like these the subjects look almost pasted into the scene. Crop it and you've got yourself a nice family photo. Is it just me or do the sitters in the cropped photo appear more lifelike than in the wider version? A key question for me is how the earlier shows at Blue Sky and Fraenkel were curated. Were they edited as straight portraits like the photos on the cards? Or did they include some of Borensztein's meta-portraits? Borensztein's photos can go either way. Since I wasn't there I have no idea, but it's fun to speculate. If the earlier shows were edited as straight portraits it would comment not just on the shifting perception of his photos but on the wider change since then generally, the growing trend of photography which comments on photography. If you saw one of these shows can you please notify me? Anyway, glad to have found the book and added it to my collection. I don't think I could dissect a book or body of work like this but this is a treat. This is a great set of portraits and the "meta-" attribute is well-deserved. The last pair of photos in particular gave me goosebumps. They do look unreal with the props exposed indeed. I guess I now have to look for this book (and so many more of your recent finds).